First we flew one then we jumped out of one….. Lately I have been reminiscing about 2015 and all the crazy adventures I had! 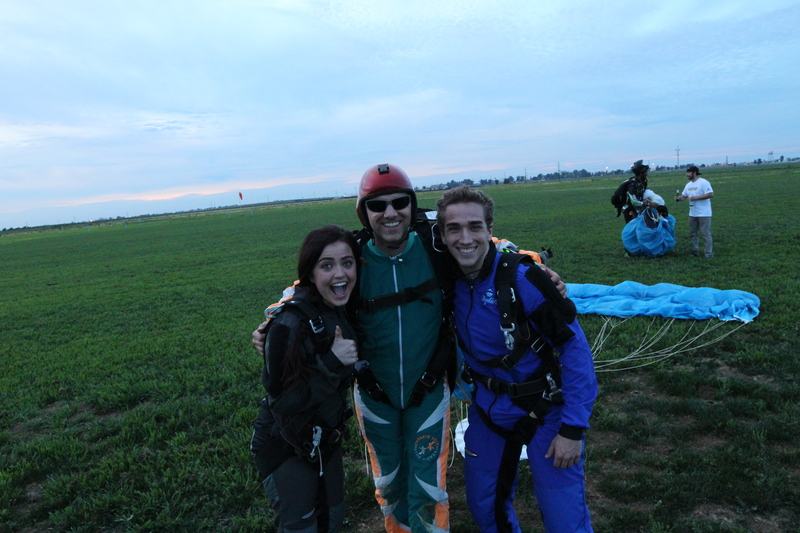 One of my favorite and most memorable experiences had to be SKYDIVING! It was the most thrilling and terrifying day of my life. My husband and I were recently talking about it and I told him “I wanna go Skydiving once a year for the rest of my life. 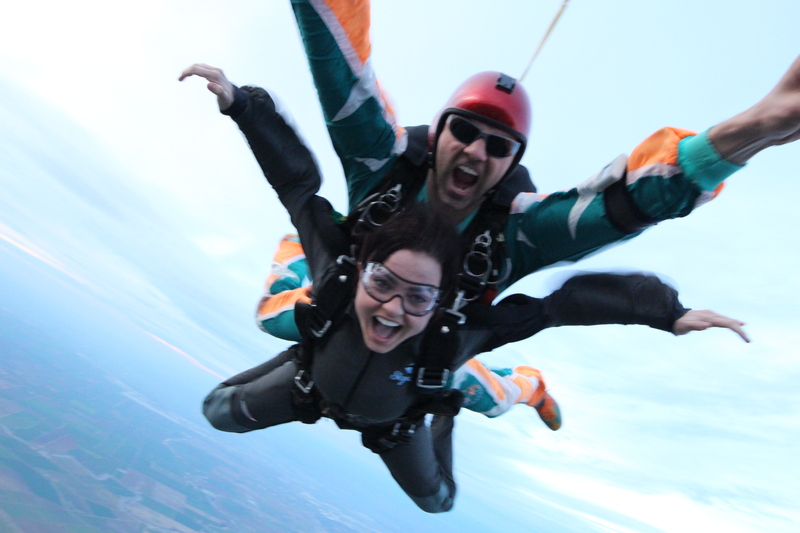 I want to remind myself that I am alive and to enjoy every second of it.” I know it sounds a little crazy and different but I genuinely felt so grateful for my life when I was jumping out of that plane. A year ago this month our friend Anthony bought Michael a certificate to go skydiving for his birthday. Awesome present right?! He had been trying to convince us to go for a long time and we always had an excuse, so he finally just got it for him. 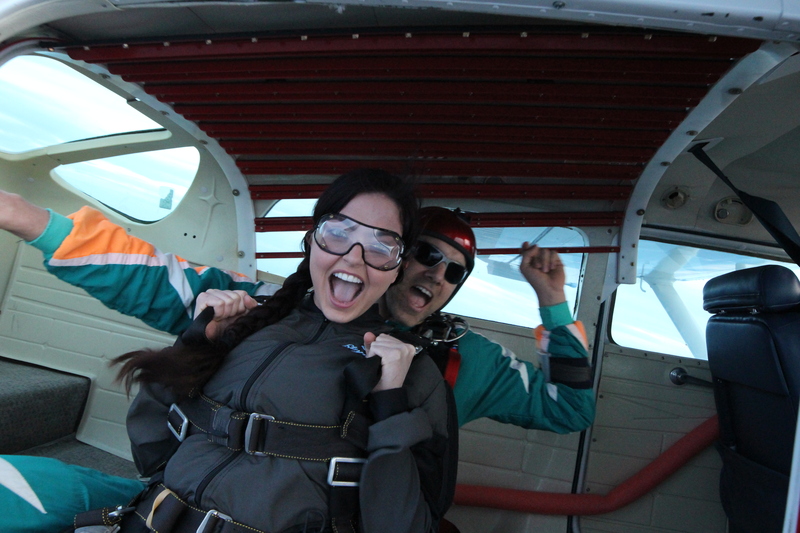 I had no intention of jumping out of a plane at 10,000 feet that day … NO WAY!!! I was there for moral support and to make sure my husband made it out ALIVE. 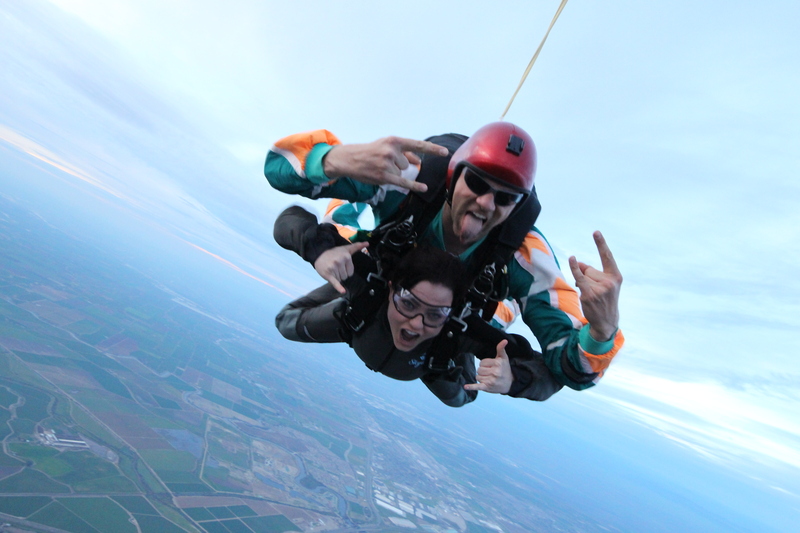 But on the hour and a half drive to “Skydive California” while on the phone talking to my dad, best friend, and Michael they all convinced me to jump! I was freaking out ….. 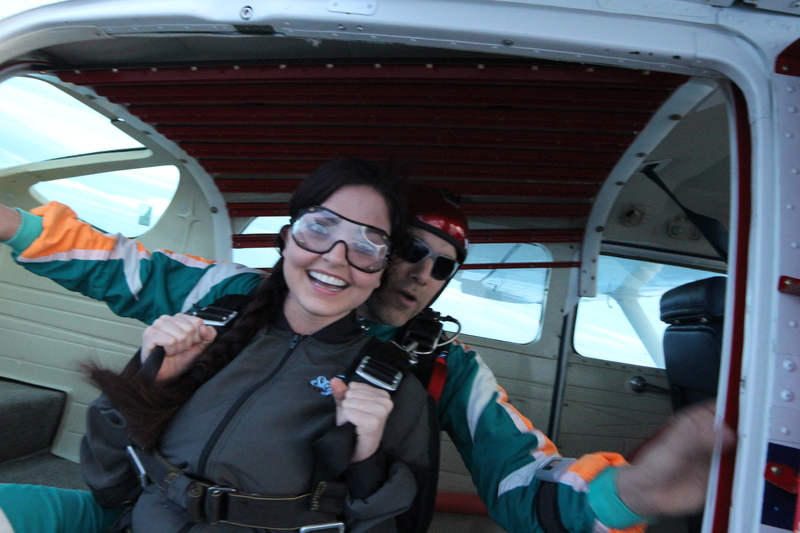 I mean honestly it’s not every day you fling yourself out of a plane…. let alone relying on someone else to pull the parachute. 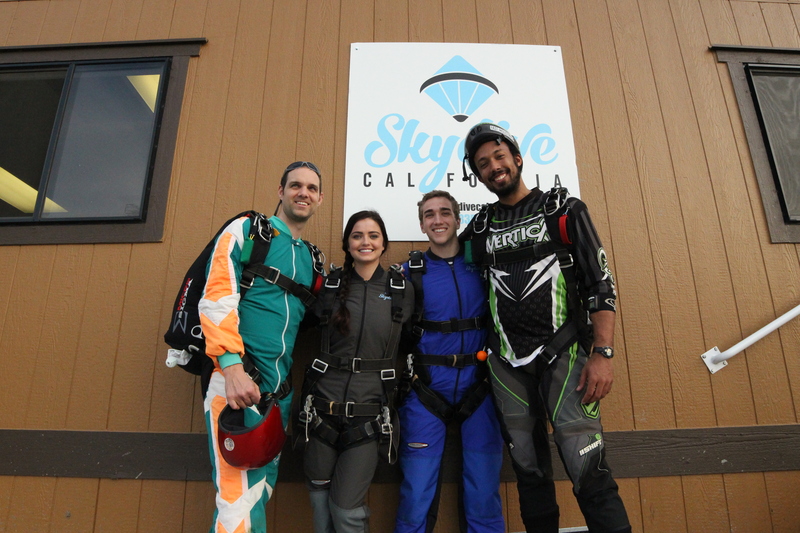 We show up to SkyDive California and the first thing that I see is people falling out of the sky. I started to rethink my absurd decision. 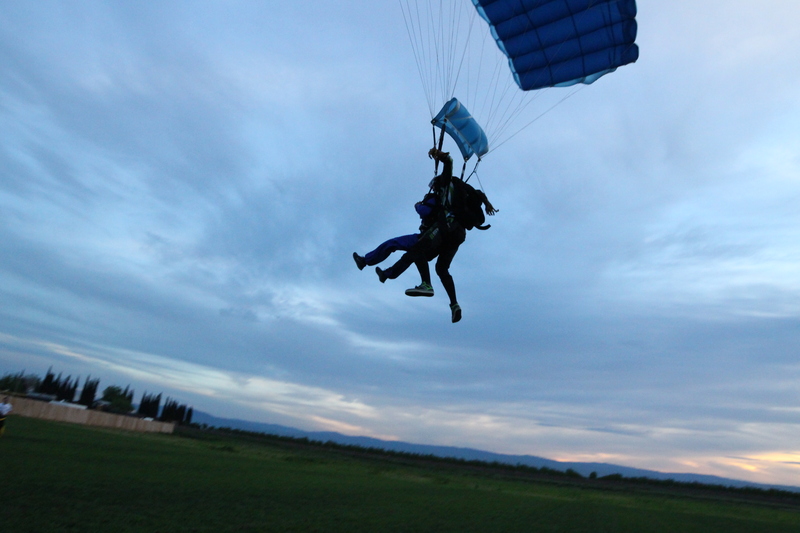 I had always told people I wanted to skydive on my 100 birthday but I guess 80 years earlier wouldn’t hurt. After you sign your life away you go and meet your instructors. My instructors name was Lee and he was so AWESOME! He made me feel so comfortable and safe. I had to trust him with my life, so it helped that he was so nice and understanding throughout the process. We started asking a lot of question such as “How many jumps have you done, When did you start, what made you want to keep doing it” and most of all I kept asking “Am I going to die??? ?” They all laughed and reassured me that I would be fine and that I would not die…. Michael was pretty quiet throughout the entire process. He probably would not admit it but he was just as scared as I was. 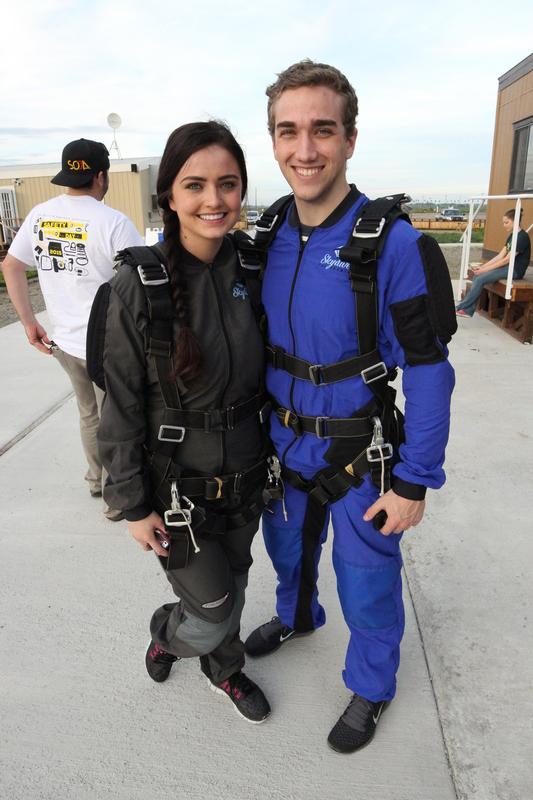 Before we headed the plane– Michael and I were discussing whether to call our Moms before or after we jumped. We both decided we better call then before just IN CASE anything happened. When I called my mom she started crying and tried to talk me out of it. In a way it made me less nervous having someone else be more scared than I was! The plane took about 20 minutes to get up to 10,000 feet…. those 20 minutes felt like forever and a great opportunity to talk yourself out of it a hundred times. When we reached the altitude and they told us they were ready to open the doors. What did I do? Well I did what any sane person would do……. I started screaming at the top of my lungs. 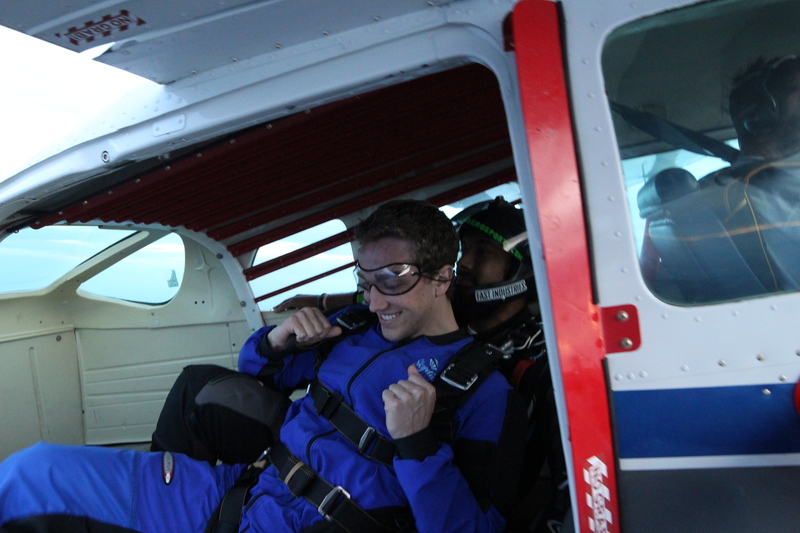 Everyone in the plane started laughing and Michael and his instructor started to move to the edge of the plane. Michael looked back at me and all I could say was I love you. 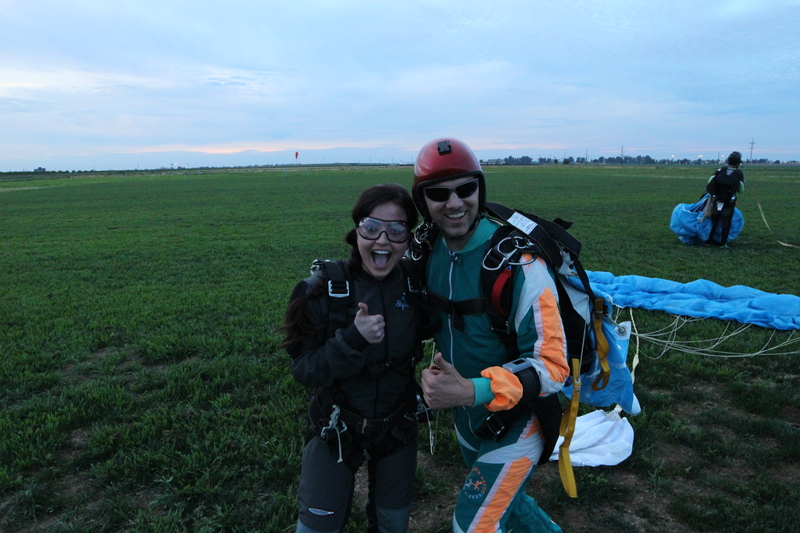 Watching your husband jump out of a plane is almost scarier than jumping out yourself. We slowly made our way to the edge, said hi to the camera and 1….2…….3 JUMP! I have never felt to much adrenaline run through my body at one time. Looking down at the ground below me was amazing yet terrifying. You could see everything from up there. 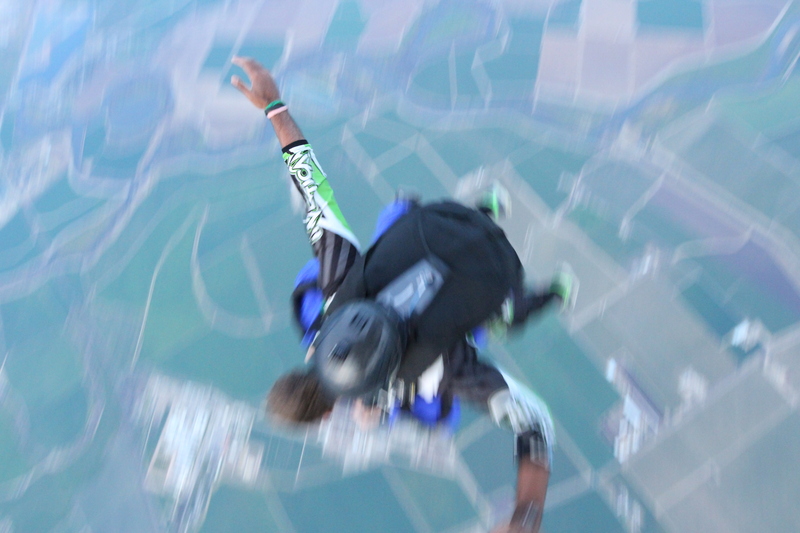 I would scream then stop then scream then stop… I was in awe that I was actually falling through the sky. Then I felt a tug as Lee pulled the parachute. After the parachute is out you basically glide the rest of the way. I can remember turning to Lee and saying “this is what birds get to experience every day.” We got to watch the sunset and take in all the beauty around us. That sunset was one of the most beautiful sunsets I have ever seen. 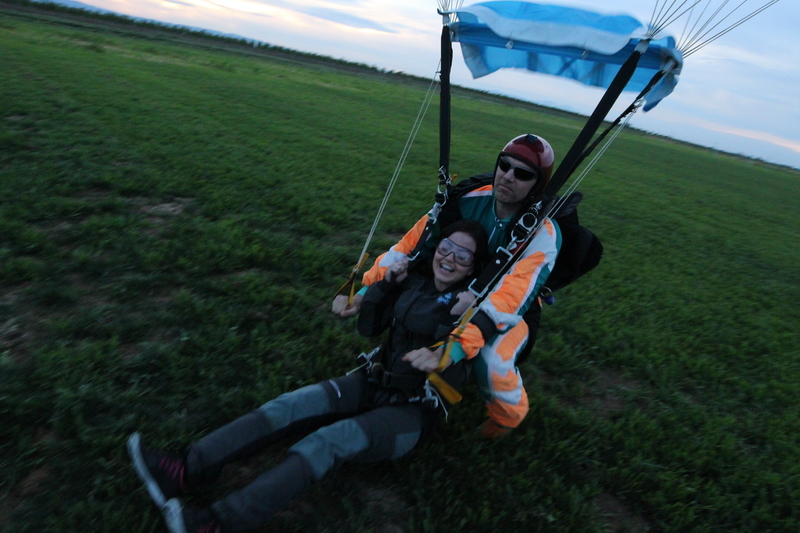 Lee let me pull on one side and then pull on the other showing me how to turn and control the parachute it was a blast! The second we landed the first thing I said was ” I wanna do it again”! It really is an addicting feeling and great adrenaline rush. I see why Anthony loves it so much. You feel free. Great story! I wish I was this brave!